Not to be confused with Galeem. Galleom (ガレオム, Galleom) is a boss native to the Super Smash Bros. series who appears in Super Smash Bros. Brawl and Super Smash Bros. Ultimate. Galleom's Subspace Bomb when he is preparing to self-destruct. 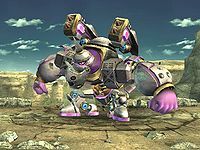 Galleom appears to be a giant, purple robot/cyborg which has simian features, and is also capable of transforming into a jet propelled tank labelled as his "Tank Form". He is covered head to toe in a heavy mechanized arsenal, possessing two rocket launchers as shoulder weapons, and powerful jets on his feet. He wears an iron mask that covers his face, as well as metallic arm braces over his bulky forearms. He is also quite agile in his simian form, capable of performing extremely large jumps, leading to the possibility that his jumps are jet propelled. In his tank form, he is much more compact, only being able to attack by either firing the missiles on his back, or simply by ramming into his foe at a high speed. As a last resort, he can set off a Subspace Bomb hidden within his head. Galleom about to battle Marth, Ike, and Meta Knight. Marth, Ike, and Meta Knight were the first to spot Galleom as he was traveling through the desert in his tank form. The trio quickly caught up to him and defeated him, knocking him down onto unstable ground which gave way, and Galleom landed in the Ruined Hall, where Lucas and the Pokémon Trainer challenge him. They manage to defeat him, and, in a last desperate attempt, Galleom grabs both Lucas and the Pokémon Trainer, starts the countdown on his emergency Subspace Bomb, then jets into the sky. Lucas manages to free both himself and the Pokémon Trainer by using PK Thunder, but in the process causes them both to fall a great distance as Galleom explodes. Meta Knight manages to catch the duo just before they land, then fly them away from the Subspace Bomb's blast. Galleom is then sucked into The Great Maze, along with the trophy of Wario, and revived; he must eventually be fought again in the Maze. Like all bosses Galleom is controllable with hacks in Boss Battles Mode. The start button will, like all bosses, self-destruct him. Galleom stomping across the stage. Galleom stomping with one foot. Galleom stiffening and falling on the player. Galleom after hitting the ground after stiffening and falling. Galleom punching both sides of him. Galleom's pose after the spin is complete. Galleom punching the ground with both fists, creating a shockwave as a result. Galleom during the high jump. Galleom's stomp after performing the high jump. Galleom dashing while in tank form. Galleom after falling from the air in tank form. Galleom firing missiles in tank form. Like all bosses in Brawl, Galleom gains an additional ×0.6 damage resistance modifier when fought in co-op mode, effectively gaining 67% more health. This modifier is applied whenever the second player is in-game, and is no longer applied if the second player loses all their stocks. 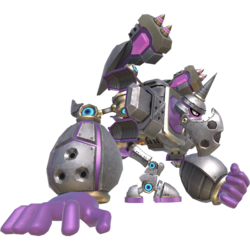 Galleom has two Trophies, one featuring his Robot Form (which is obtained by using a Trophy Stand on Galleom), and the Galleom (Tank Form) trophy, which is obtained by completing Boss Battles mode on Intense difficulty. As a side note, completing Boss Battles on Intense difficulty is the only way to get this Trophy in the NTSC version of Brawl, as using a Golden Hammer on the challenge square holding the Trophy will not work (this is not the case in the PAL version, where every box can be broken). The Galleom trophy in Brawl. An enormous, transforming robot and Subspace Army warmonger. Galleom is characterized by various attack threats, including jump stomps, beefy arm bludgeonings, and even missiles fired from his back. He also has a Subspace Bomb set in his head, which he can use in times of desperation to blow himself up and drag the player into the darkness of Subspace. He's one tough robot! Galleom with his arms and legs neatly compacted into tank form. In this form, he can get around the combat field at high speed. He can quickly change into humanoid form to take advantage of awesome combat capabilities. His last defense and most threatening trait is a built- in Subspace Bomb. In tank form, Galleom can still attack with body slams and missiles. He never runs. Galleom's render in Super Smash Bros. Ultimate. Galleom returns in Super Smash Bros. Ultimate, playing a role as a boss in Classic Mode and in the World of Light adventure mode. 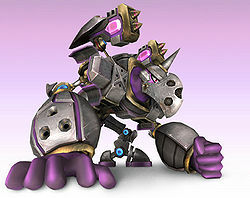 Galleom can now launch six missiles after transforming into his tank form, firing in three bursts of two missiles each. Galleom stretches his arms out, then tries to grab the fighter. If the grab is successful, Galleom will crush the player, dealing constant damage and slamming them into the ground which launches them unless the fighter breaks free. Like other grabs, this can bypass shields. 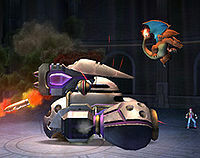 When charging in his tank form, Galleom will turn around and charge back as he returns to the battlefield in an attempt to hit the fighter again. Galleom now uses the hover jets on his feet to aim his jump attack, aiming for the fighter as he lands. When reduced to a quarter of his health, Galleom turns red and stomps around wildly, dealing flame damage if he hits the player with one of his stomps. Afterwards, all of his attack patterns are sped up and the lag between his attacks is significantly decreased. When defeated, explosions erupt across Galleom's body as pieces of it (including one of its arms) fly off before the metal monster falls over with his remaining hand on his chest, like he did in the Subspace Emissary. The Fighters that are assigned to fight Galleom in Classic Mode are R.O.B., Snake, Wolf, Dark Pit and King K. Rool. Mega Man is also assigned to fight Galleom, but it is not the final round. Galleom is assigned by Galeem to guard the Base sub area of the Light Realm, which can be accessed in a jungle like area. Defeating Galleom is necessary to weaken the shield protecting Galeem. He is later fought again during the final boss fight, along with all the others bosses except for Master and Crazy Hand. In said battle, Galleom is the first of the Light Realm bosses to appear on screen in the second phase, which could indicate him being the first boss in the game. Galleom as he appears in Super Smash Bros. Ultimate. Galleom has two different death animations. The first involves him falling over and kneeling, weakened but still operational, while the second involves him falling onto his back and subsesquently exploding; however, it is shown he is still breathing. The latter appears in the last few rounds of Boss Battles, and sometimes appears after defeating Galleom with a powerful attack at low health, such as with Falcon Punch. In Boss Battles, the arena that Galleom appears in (in the desert or in the large ruin chamber) is random. The music in the battle is the same as the Duon battle, as they are both the only bosses who hail from Brawl, aside from Tabuu. Galleom is the only boss in The Subspace Emissary who is battled twice before The Great Maze. Therefore, Galleom must be battled three times to complete The Subspace Emissary. After the Great Maze is completed, one cannot fight Galleom in The Wilds (Part I). Galleom's Subspace Bomb is set for 15 seconds, whereas all of the other ones were set for 3 minutes. Galleom is one of two bosses (the other being Tabuu) to appear in two forms of trophies. For Galleom, it's the normal one via the Trophy Stand and the one for completing Boss Battles Mode on Intense. Galleom is the only boss from the Subspace Emissary to appear as a boss in Super Smash Bros. Ultimate. Oddly, in Ultimate, Duon's spirit battle plays Boss Battle Song 1, as in the Subspace Emissary, but Galleom's boss battle plays the song from Boss Battles in Brawl. This page was last edited on April 21, 2019, at 11:19.